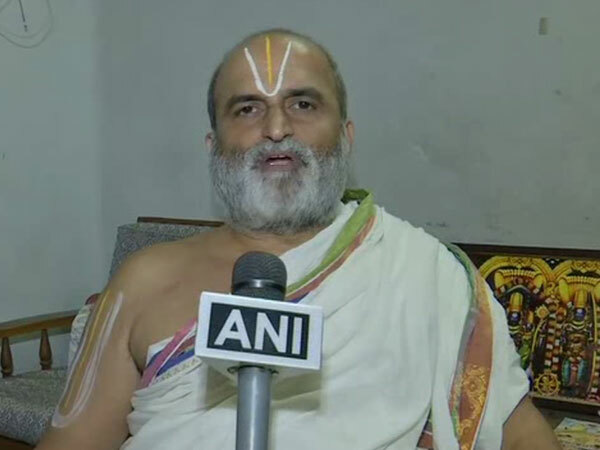 Hyderabad (Telangana) [India], Apr 2: Welcoming Rahul Gandhi's decision to contest from Wayanad in Kerala, head priest CS Rangarajan at the popular Chilkur Balaji temple here said he was curious to know the opinion of the Congress chief on the Supreme Court judgment to allow women into the Sabarimala temple. “We will welcome Rahul Gandhi to south India as he is contesting from Wayanad, Kerala. On behalf of the Hindu priest community, we have a few questions for him as he is showing a lot of interest towards the temple system. On the issue of Sabarimala Temple, the Supreme Court gave judgment.. So, are you supporting the judgment or do you have any different approach,” Rangarajan told ANI. Rangarajan added, “On the issue of eve teasing of girls in Pollachi, DMK party leader Viramani made a comment which hurt Hindu sentiments. Nearly four months after the apex court permitted women of all ages to enter the temple on September 28 last year, two women aged below 50 years entered the Lord Ayyappa temple to offer prayers.